We revised our list of snorkeling cameras on the market in 2019 to figure out which ones perform best vs price point. Looking to capture your snorkeling adventures in high-quality resolution? Here is our top picks and buyer's guide for best underwater cameras for snorkeling. Why use an Underwater Camera for Snorkeling? The upgraded series of AKASO Brave 4, the Brave 6 can quickly become your primary action camera for outdoor adventures and watersports. Robust, compact construction and a nice heft of only 2.75 ounces make the camera easy to maneuver in all circumstances. Smooth lines, easily accessible controls, and an oversized screen blend in flawless aesthetics. This 4K action camera inspires quality from first glance. Before talking about its pros and cons, let’s have a quick look at its main features. 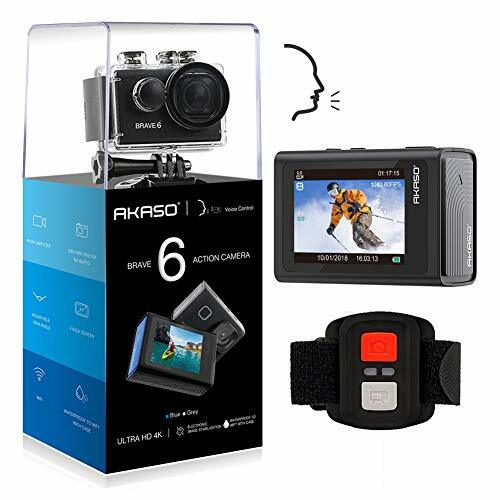 The AKASO Brave 6 action camera is designed for capturing stunning photos, full HD videos and unique time lapses thanks to its quality 6G lens and top-notch system. With a sensor resolution of 14.24 megapixels and 6x digital zoom, the camera is easy to adjust as desired. You can also change the angle of view from narrow to wide according to your needs, from 70° to 170°. All these settings help the Brave 6 deliver the versatility expected from a high-end action camera. If you want to document your adventures or record time-lapse videos, know you’ll have the possibility to capture everything in full HD 4K/24 fps mode. It is easy to understand the battery drains faster in this setting. However, you can also set a lower video resolution if you want to. Fun to use and versatile, this action camera boasts six image-capturing modes including photo and video, looping video, time lapse, diving mode video lapse, and burst photo. A wealth of settings and sensors also give you the possibility to make fine adjustments of the image quality and personalize your images with time stamps or logo watermarks. If you want peace of mind, enable the auto power-off function, and the camera will turn itself off when not in use, saving the battery’s life. Regarding color and image clarity, the AKASO Brave 6 delivers crisp photos and videos characterized by strong, vibrant colors. Overall, this action camera has satisfactory performance and produces excellent results. Undoubtedly, an excellent choice for amateur photographers, athletes, and outdoors lovers who want to immortalize their journeys. 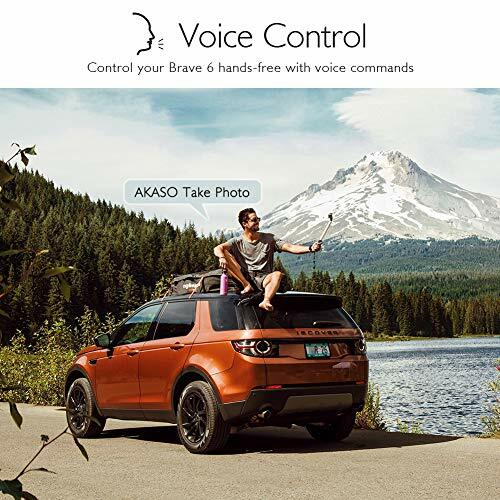 Developed with the growing “selfie” culture in mind and thought for your comfort, the Brave 6 features voice and remote control via WiFi. Both controls allow you to either take photos or start recording videos while keeping your hands free. Fix the camera to a selfie stick or tripod and use one of the six voice commands to take control of your gear. For instance, you can say “AKASO take photo” and have your photo shoot without further intervention from your side. The remote control comes in the form of a wristband with photo and video buttons on it. The band communicates with your gear via WiFi, and the camera will tell you which command it received. Although the voice prompt feature is fantastic because you’ll be informed if the Brave 6 is indeed doing what it’s supposed to do, know that there is no way to increase the voice’s volume. While this isn’t a significant drawback, if you’re moving or wearing a helmet, chances are you won’t hear the prompt. Perhaps the most praised capability of Brave 6 is that of shooting perfect underwater photos. The quality of its underwater videos is also outstanding, and all this is possible thanks to the included waterproof case. The case is made from an ultra-strong polymer that resists scratches and water pressure to a depth of 89 feet — a characteristic unrivaled even by the famous brands, including the more expensive GoPro. Despite being explicitly made for immersions, the case can also protect your gear on land. Let it on your camera to keep the Brave 6 safe from scratches, rocks, and dust. Thanks to the crystal clear material, it won’t alter the quality of your images in any way. Another impressive feature is the electronic image stabilization (EIS); this technology is designed to provide perfect shots even when you’re moving and consists of motion-detection and anti-shaking sensors and stabilizers that improve the overall quality of your photos and videos. As you could expect from quality action gear, the camera doesn’t come alone. AKASO included in the box a bunch of accessories and attachments designed to boost your user experience. The most useful are the two batteries which power your gear. Each battery has an average runtime of 90 minutes and incorporates fast charging technology. Naturally, some photo and video recording settings can drain the battery faster than others, yet we’re convinced you’ll be satisfied by its performance. Useful are also the multiple mounts and stands. The camera comes with a versatile bicycle stand as well as a helmet mount, two clips, and seven other types of mounts. Furthermore, the pack also includes five tethers and a USB cable for computer connectivity. Smartphone connectivity and real-time sharing. Video stabilizer reduces movement shakiness. Easy to adjust video angle options and optical zoom. Menu navigation could be improved. The underwater case can be challenging to open and close. Affordable, sleek, and performing, the AKASO Brave 6 is worth every dime. This action camera won’t cost you an arm and a leg, it provides quality images and comes with all expected from high-end gear. It’s perfect for outdoor lovers and amateurs, either on land or underwater. Boasting best-in-class features and compact enough to fit in a backpack pocket, the Brave 6 has all it takes to become your primary action video camera for all your adventures. The Campark ACT74 is an action camera that allows you to capture your snorkeling adventures in high-quality resolution. Using the +Sony Sensor mechanism, the camera can record 4K video footages at 30 frames per second (fps) or take photos at 16 megapixels. It has a built-in 2-inch HD LCD Screen where you can playback your photos and videos made, even if you are underwater, courtesy from its 170°Ultra wide angle lens. Using a micro SD card, you can store photos and videos of up to 32 gigabytes. ACT74 can be remotely operated through WIFI using iOS or any android systems. This means that you can remotely control and manage the camera over your smart phone. You can instantly view your photos and videos, or share them directly on social media. On top of the high resolution and smooth user experience rating, the good thing with Campark ACT74 is that you can continuously use and operate the camera for up to 180 minutes. When it comes to snorkeling and other water-based recreational activities, the Campark ACT74 goes with its own waterproof case that is rated to go 30 meters (100 feet) deep. This underwater capability makes the camera also great for swimming, scuba diving, and surfing. The box is packed with several multifunctional mounting accessories where you can either place the camera on your wrist, helmet, surfboard or at the top of your snorkel mask. Just do not forget to lubricate the rubber seal with silicone grease for an extended rubber life. There is even a mounting accessory designed for bicycle use. 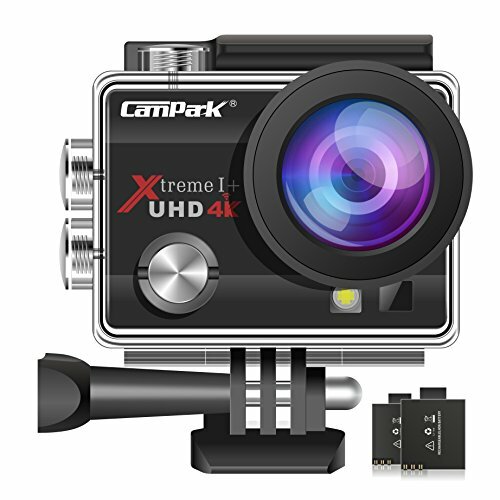 Compared to other action cameras out in the market, the Campark ACT74 is one of the lowest priced one that you can get. 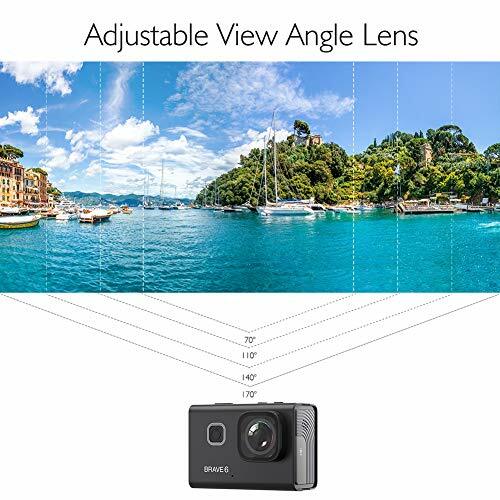 The price is relatively inexpensive provided that it features high-resolution photos, videos with a slow-motion rating at 720p and multifunction controls such as time lapse. The only downside that we see on the Campark ACT74 is that it has no image stabilization. This means that you need to focus on your subject and have a steady shoot for good quality images and videos. While it has an LCD screen, it has no touchscreen feature. And lastly, when installed with its underwater casing, the camera unit, in general, becomes slightly bulky. However, it is still relatively compact and lightweight when you compare it to the old-school cameras. Among the long list of hobbies we enjoy, going to the beach and go snorkeling is one of our favorite. In fact, we treasure this particular aquasport that we make sure every moment is documented and that’s the reason why most, if not all of us, brings a camera. But make no mistake in bringing just any kind of camera. It should be an underwater camera. Otherwise, you will have a flooded unit. In the old days, underwater cameras were heavy and bulky. Snorkelers back then need more leg power just to propel themselves in the water while holding the camera equipment. Traditionally, old underwater camera units are composed of a camera, a sturdy casing and an external strobe where in most instances, are heavier than the camera and casing itself. Not to mention that everything is controlled manually and that the number of shoots that you can take underwater is dependent on the type and capacity of the film that you are using. New-age underwater cameras still employ the same concept. However, everything now is compact and digital. Small and compact Digital Cameras have become a hit in the nineties. And coupled with its compatible casing, viola, you have an instant underwater camera. You don’t need to bring a separate external underwater strobe as the internal flash of the digital camera will suffice. You have endless possibilities of shooting your favorite underwater subject, as SD cards have replaced the old film allowing you over a hundred, if not thousands, of underwater photos to shoot. The only thing that can be considered remnants of the old-fashion camera is the manual controls. With underwater digital cameras, you still need to make the necessary adjustment for you to have a high-quality underwater photo, without the fuss and blur. However, as they say, it: technology is speeding fast like lighting, a digital camera was suddenly out of the trend with the introduction of “Action cameras.” From your mid-size digital cameras, people are now using action cameras for reasons that they are highly compact, lightweight and relatively small in size. To give you an idea, most, if not all sizes of action camera do not exceed the palm of your hand. It’s that small. Aside from being compact and lightweight, action cameras employ the point and shoot technology where your hands are being freed from frequent adjustments of the setting. Just turn on the camera and press the shoot or record button. Unlike old cameras where you need to buy a separate case, action cameras usually come and offered with its own underwater casing. During its early days, action cameras were worn using a lanyard and strapped to your hand. However, it has evolved that its operation has become hands-free. Most new models have accessories where you can mount the camera on your wrist, helmet or use it using a selfie stick making it a highly versatile photographic and video recording equipment. Lastly, on top of all these features, what makes people keep using action camera is the high-quality resolution where most recent models have an integrated stabilization system that significantly reduces the shaky recordings done by most newbies, just like me years before. And do not worry if it's a high-resolution camera where most of its photos and videos take up more space, most action cameras are now using micro SD cards which can store more pictures and videos compared to SD cards. I am not talking about specific brands such as GoPro, Panasonic, Nikon, and other brands but what kind of camera you need. Firstly, snorkel masks now can come with an attachment for your mask so you can put your camera right on your head so you can film your entire snorkeling adventure and then edit and make a video later. You may want a handheld camera that you can attach it to your wrist or even hold it so you can take basic pictures and small videos. You may want a camera with a great zoom on it so you can get up close and personal with the marine life. Underwater camera or a waterproof camera: Some cameras will say they are waterproof up to a certain depth such as 10 meters or 30 feet. So you need to know how deep you will be diving down to so you are not to wreck your camera. Underwater cameras have housing to protect the camera and can usually go down much deeper and are built stronger that can withstand the pressure. FYI: Underwater and waterproof can be used out of the water so you do not have to have 2 separate cameras and it becomes and nuisance. To sum up, there are lots of options and price ranges for underwater cameras. It all depends on how much you will be using it and how much you want to spend. You can get cheap underwater digital cameras and cheap waterproof digital cameras, and there is a difference between the two. I tried to go over the differences between the two of them. There are lots of things you need to consider before buying an underwater camera: what kind of pictures you will be taking, will you be making movies, do you want a camera that will attach to your head so you can film everything that you see, etc. These are just some of the questions you need to think about before buying a camera, so you get what you need. For the purpose of this article I started from talking the fundamental models from quick and easy cameras to a little more complicated but if you are taking pictures or videos for National Geographic! or want exceptional cameras for a dive shop this may not be the best site for you even though it will give you reliable information.